An Independent Inquiry is now investigating the cause of the water-borne outbreak caused by Campylobacter in Havelock North. In this blog we consider the background to this issue and argue the Inquiry must not miss the opportunity to think up-stream, on the scale of water catchments, agricultural economies and climate systems. “Alarming new threats to NZ’s drinking water” is the headline on the cover of a recent New Zealand Listener. It refers to the outbreak in August in Havelock North, in which more than 5000 people, a third of the population, became acutely ill after contamination of the town’s water supply with the organism Campylobacter, and which is now the subject of an Independent Inquiry. It certainly is alarming that so many people can become sick so quickly due to a failure in the supply of drinking water. But the threat is not new: outbreaks of this kind have occurred in New Zealand previously, many times. In Darfield in 2012 more than a hundred people were affected when animal effluent was washed into a well by heavy rain. A NZ review of campylobacteriosis reported that there were 42 outbreaks between 2000 and 2004 in which water was considered to be the likely source (Table 6.8 in: Wilson, 2005). Furthermore, the review pointed to six detailed publications and reports on water-borne campylobacteriosis outbreaks during this period (Table 5.1 in Wilson, 2005). Why is it that outbreaks like this continue to occur, when the causes are well-understood, and one would think a rich country such as New Zealand has the means to prevent them? Looking for clues, we turned to a 2007 paper on drinking water outbreaks in affluent countries over 30 years (Hrudey & Hrudey, 2007). The authors examined 73 case reports, describing only a small proportion of all outbreaks, but affecting nevertheless hundreds of thousands of people. What is clear from the reports is that it is impossible to completely eliminate the potential for faecal contamination of water supplies in and around most human settlements. 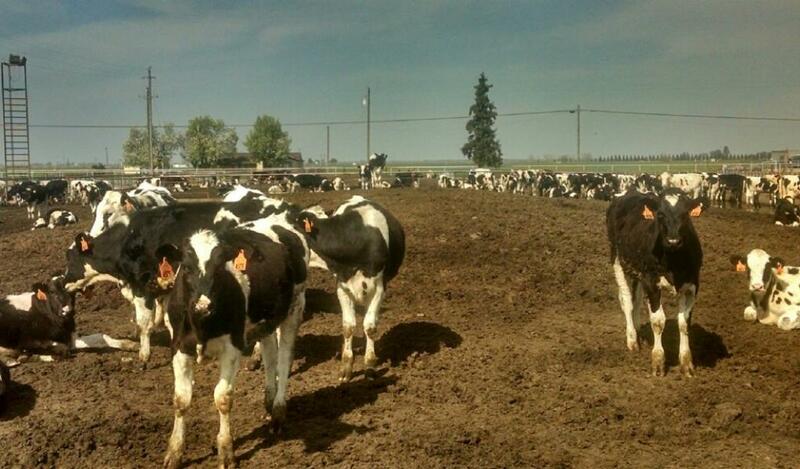 To keep pathogens at bay, there need to be multiple lines of defence. When the first defences are breached, the loading of pathogens tends to be erratic, difficult to predict and unevenly distributed through the supply, so treatment processes must be robust and thorough. But in many countries (including New Zealand) the current processes for identifying and treating water-borne pathogens are imperfect. Some pathogens (Cryptosporidium for instance) are not affected by chemical disinfection, the method used most commonly to cleanse drinking water. The tests used for monitoring supplies (such as those applied in New Zealand for the presence of the indicator organism E. coli) provide only a guide to what might be in the water and may miss the presence of significant pathogens. Moreover, for tests that rely on bacterial culture (such as for E. coli) there is inevitably a delay of two days or more between taking the sample and receiving the result. Since waterborne outbreaks are rare the indicator tests will inevitably return a preponderance of false positives, an epidemiological truth that is not widely-understood. These points fit the Havelock North story. The water to the town was drawn from what was deemed a “secure supply”, but in hindsight it appears there was contamination, probably sometime in early August, by faecal organisms, probably coming from sheep or cattle. The supply was untreated, and by the time the first positive monitoring results were confirmed, hundreds of people were already showing the signs of campylobacteriosis. In the past Havelock North drew its water from three bores; one of these was closed in 2015 after high levels of E. coli were detected (apparently without human cases of illness). The big lesson from Havelock North, some have argued, is that we must chlorinate all water supplies. Failing to do this is “like driving without a seat belt. It isn’t safe, and never was”. However, chlorination won’t deal with all pathogens, as already noted, and getting the dose right for sensitive organisms such as Campylobacter requires careful monitoring and constant attention to the supply. Who will do this for the numerous small untreated supplies around New Zealand such as those serving Pakanae (population 160), Kaihu-Dargaville (324) and Baylys Beach (228)? And some may think it is a good idea to avoid using large amounts of chlorine in the public supply, wherever possible, not just for reasons of taste, but also, possibly, for health reasons (such as risks associated with chlorinated by-products) (Wang, 2007). Undoubtedly, there are improvements that should be made in the operations of drinking water supplies, and the safety procedures for testing them and responding to contamination. Perhaps chlorination or other methods of disinfections should be more widely applied. But there are also bigger matters at hand. Fresh water resources in New Zealand are stressed by rising demand for water, growing populations, changes in land use and the expansion of livestock industries, dairy farming in particular. All these forces are present in Hawkes Bay, including increasing draw down from aquifers for commercial purposes (such as the Miracle Water plant in Waipatu) and the spread of intensive feedlot operations. 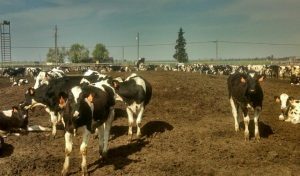 This stress is reflected in deteriorating measures of fresh water quality, including a rise in nitrate levels and a fall in biodiversity, across the country, but most marked in areas where dairy farming is on the rise. 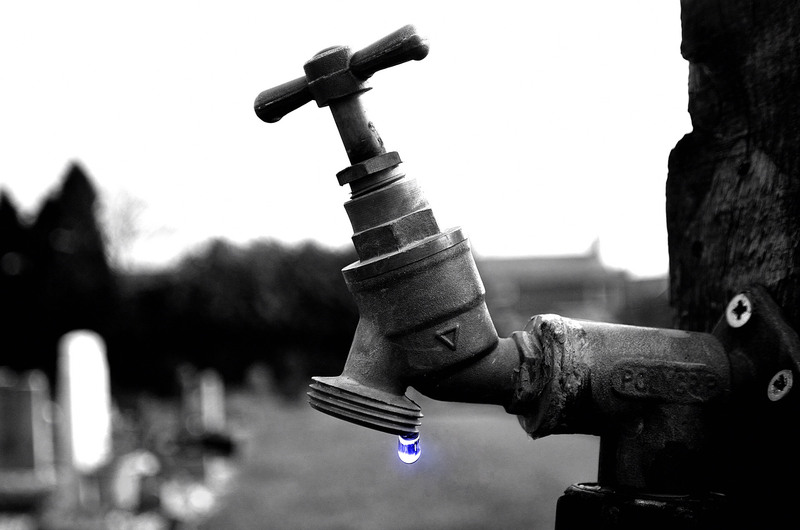 According to the most recent 5 year report from the Hawkes Bay Regional Council, a third of fresh water monitoring sites show deteriorating quality, more than double the national average. Environmental pressures are evident also in the health statistics. New Zealand has very high rates of endemic gastroenteritis (illness not related to specific outbreaks). National rates of enteric illness caused by organisms such as Cryptosporidium and Giardia exceed by a wide margin the rates in Australia, the UK and the United States (Lal et al, 2015). The incidence of campylobacteriosis was halved by improvements in food safety in the New Zealand chicken industry, but it is still one and a half times that of Australia (Sears et al, 2011). Climate is another important driver of disease risk. Of all the outbreaks of waterborne disease reported to the US Environmental Protection Agency between 1948 and 1994, half were preceded by extremely heavy rainfall (defined as daily precipitation above the 90th percentile) (Curriero et al 2001). An example is the largest ever reported waterborne disease outbreak, in Milwaukee, USA in 1993, when more than 400,000 cases of illness were caused by heavy rainfall and runoff that overwhelmed the capacity of the drinking water treatment plant (MacKenzie et al, 1994). 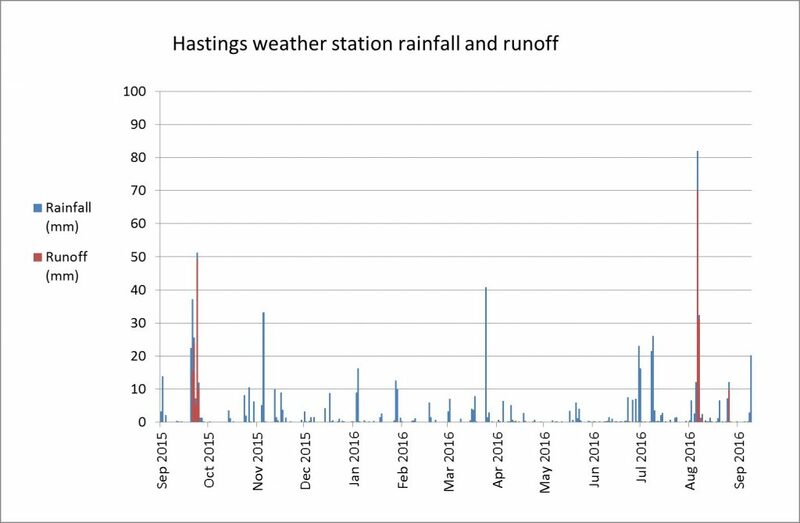 The outbreak in Havelock North was preceded by the heaviest daily rainfall recorded in at least 10 years by the Hastings automatic weather station: 82mm in the 24hours to 9am on 6 August. The rainfall may have caused the first substantial runoff in the area for nearly a year (Figure 1 below). It is our hunch, according to the timing and intensity of precipitation, that this extreme weather event played a part in contamination of the water supply. It is relevant of course to note as well that projections of climate change anticipate up to a 4 fold increase in extreme heavy rainfall in most parts of New Zealand in the next 50 years (though Hawkes Bay may become drier overall) (MfE, 2008). Figure 1. Daily rainfall and estimated runoff at Hastings automatic weather station, September 2015 to September 2016 (data from: cliflo.niwa.co.nz). The late and great epidemiologist Tony McMichael published a paper in 1999 entitled “From hazard to habitat: rethinking environmental health” (McMichael 1999). He argued that the arrival of reductionist thinking in modern medicine had its parallel in environmental health. This was the shift from broad assessments of the quality of environments to a tight focus on specific physical, chemical and microbiological agents. Once hazards are identified, the next step, according to this view of the world, is to launch therapeutics-style search and destroy missions. McMichael pointed out such an approach neglects prior causes, and assumes, unwisely, the inexhaustible integrity of biological and physical systems that are the ultimate health promoting agencies. This is why, he argued so crisply almost 20 years ago, environmental health should up-scale. Havelock North is yet another signal that there are serious big picture environmental problems in New Zealand. Of course it is important to detect and deal effectively with the threats in our drinking water supply. But it would be a great mistake to be trapped by the hazard paradigm; this issue is bigger than organisms and disinfectants. We have to also tackle threats to our water supply. This requires up-stream thinking, on the scale of water catchments, agricultural economies and climate systems. It would be a great waste if the Independent Inquiry focused only on the proximate causes of the outbreak. The bigger question is what we need to do to protect the quality and sustainability of the New Zealand habitat. 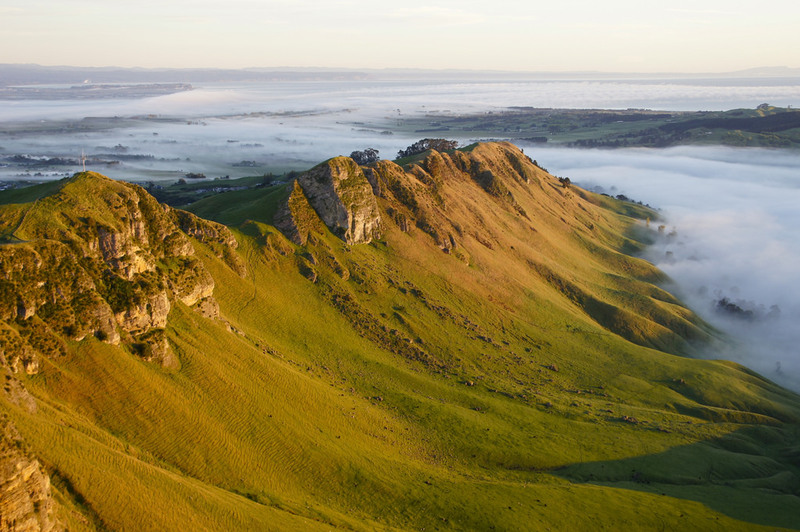 Te Mata Peak, Hawke’s Bay. Credit: Flickr / itravelNZ. Ministry for the Environment. Climate Change Effects and Impacts Assessment: A Guidance Manual for Local Government in New Zealand. 2nd Edition. Mullan B; Wratt D; Dean S; Hollis M; Allan S; Williams T, Kenny G and Ministry for the Environment (MfE). 2008: Wellington). Wang GS, Deng YC, Lin TF. Cancer risk assessment from trihalomethanes in drinking water. Sci Total Environ. 2007;387(1-3):86-95. Great to see a link to water quality and environmental health promoted, but your suggested link between gastroenteritis and nitrate concentrations is crude (e.g., consider whether nitrate pathways are those of faecal pathogens). Instead of simply placating post-normal scientists “believing” rather than demonstrating that dairying was responsible for the Havelock North incident, why not attempt as others have to link incidents of gastroenteritis to the wider stocking numbers of all contributing animals in a catchment (e.g., faecal source tracking pointed to all drystock and dairy “ruminants” being dominant source of E.coli in the Havelock North bore 3, of which sheep>>beef>dairy in the Tukituki catchment – not that stock numbers alone govern risk). Given livestock access is a critical contributing factor to waterborne faecal pathogen loads, why focus on a sector rather than the practices, especially as those practices are present across many sectors (e.g., effluent practices are admittedly unique to dairying, but livestock access & crossing management, pest management and riparian management of runoff-supplied faecal matter all represent dominant pathways for faecal pathogens entering rural New Zealand waterways; all being issues for drystock, dairying and deer sectors collectively with pest contributed loads an issue for the forestry sector). Ironically, beginning anew the old whipping of dairy (who incidentally represent the only sector with stock-exclusion, crossing and riparian agreements in place, nationwide), is hardly going to address the ongoing sources nor remedy risks of faecal contaminants upstream of water supplies. For instance, you could have highlighted the exceptionally high loading of Campylobacter from sheep paddocks and the marked absence of regulation affecting sheep faecal loading to water in regional or national planning (i.e., order of magnitude greater on a per Ha basis, that of a dairy operation at 5 and 3 animals/Ha respectively – with considerably more catchment area in sheep use than dairying across NZ generally) . More readers might then realise the risks presented by a sensational focus on dairying in a “think big” piece extolling the virtues of “mountain-to-sea” thinking and integrated catchment management of faecal pathogens.